When you think of bank robbers, ski-masked men seizing a bank with guns blazing might be the predominant mental picture. Oh, but that’s soooo over. Thieves no longer have to threaten tellers or ransack vaults to get their loot. But they do need tech expertise, a group of henchmen and planning. Lots and lots of planning. At least that’s what it took when a team of men — both computer and networking experts and street thugs — targeted ATMs in a highly sophisticated set of robberies recently. The culprits orchestrated two thefts that spanned more than a dozen countries with a total payload of $45 million. These were no garden-variety heists. “The organization worked its way from the computer systems of international corporations to the streets of New York City, with the defendants fanning out across Manhattan to steal millions of dollars from hundreds of A.T.M.’s in a matter of hours,” says Loretta E. Lynch, the United States attorney in Brooklyn. According to the indictment, the first heist took place on Dec. 21. The tech experts hacked into the system of an Indian company that processes prepaid debit cards. Targeting prepaid MasterCards issued by the United Arab Emirates’ RakBank (National Bank of Ras Al-Khaimah), they raised or eliminated withdrawal limits. Then they sent out the account numbers — five, in all — to operatives in 20 different countries, who encoded the data onto magnetic-stripe cards. With cards in hand, the global network of “cashing crews” made 4,500 ATM transactions amounting to $5 million worldwide, which wound up getting laundered via luxury purchases, such as Rolexes and pricey cars. Emboldened by its earlier success, the team returned for another heist in February. The crews were staked out at locations in New York City, as well as other places in two dozen other countries. The hackers repeated their earlier tactic, but on a U.S.-based credit card processing company. They obtained 12 account numbers for pre-paid cards issued by the Bank of Muscat in Oman, raised the withdrawal limits, and triggered the cashing crews. On the streets, the men set out at 3 p.m., and 10 hours later, they had successfully conducted 36,000 transactions worldwide for a total of $40 million. In New York City alone, eight people were responsible for 2,904 withdrawals amounting to $2.4 million. In Japan, where some bank allow $10,000 limit for a single withdrawal, the thefts were predictably more productive. That crew snagged about $10 million. 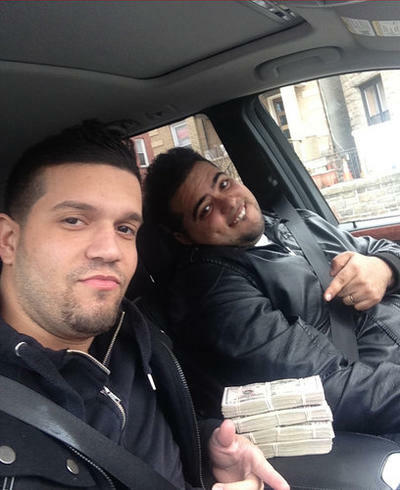 Ultimately photographic evidence, like surveillance footage and ATM images, led the authorities to the New York crew. Most of them were in their early 20s, and all of them are American citizens based in Yonkers, NY. The suspected leader, Mr. Alberto Lajud-Peña, 23, fled the U.S. as the authorities started closing in. Little did he know that he would never get to enjoy the fruits of his labor. Last month, his body was found in the Dominican Republic. He had been playing dominos when the house was attacked by unknown gunmen, who killed Lajud-Peña but left behind his cut of the heist — $100,000 in cash. It was still sitting in a manila envelope at the scene when police arrived. If all this sounds like the plot of a movie…well, just wait for it. It’s bound to hit theaters at some point, just like another epic New York caper known as the 1978 Lufthansa robbery. The thieves, who stole $5 million in cash and $875,000 jewels 35 years ago, inspired a well-known and beloved 1990 film: Goodfellas.